We are the quality leader: Jarrett Publishing Company is renowned among educators for the excellence of its products. Each of our publications is carefully tailored to match state learning standards, to provide the best content review, to incorporate the latest educational research, and to include the most authentic test practice questions available. With these ingredients, your students are certain to improve their learning and to raise their scores on statewide tests. The best preparation available for Ohio's new Grade 6 social studies test. This book is only sold in sets of ten. A set of ten books costs $129.50. ★ Highly focused content summaries in each chapter provide the most essential information your students need to know. ★ All of the fundamental social studies skills required by the new curriculum are presented. ★ For each strand, a unit pre-test allows you to see what your students already know. A unit test later allows you to assess what your students have learned by the end of the unit. The best preparation available for Ohio's new Grade 4 social studies test.This book is only sold in sets of 10. The price is $129.50 for a set of ten. ★ Highly focused content summaries in each of the 24 chapters provide the most essential information your students will need. ★ All of the fundamental social studies skills required by the new curriculum are introduced in this book. ★ A Unit Pre-Test allows you to see what your students already know. A Unit Test then allows you to assess what your students have learned. This book consists of 17 fun-filled and exciting activities that are completely aligned to Ohio’s model social studies curriculum. It can serve as perfect primer to prepare for the sixth-grade test in social studies. All of the Grade 6 social studies Student Expectations for learning required by the new social studies curriculum are found in the book. In addition, many of the standards in English Language Arts curriculum are also covered. This book is only sold in sets of ten, for $129.50. Ohio in the United States is a fun and exciting activity book that is narrowly aligned to Ohio's learning standards and model social studies curriculum. No other resource can better prepare your students for Ohio's new fourth grade social studies test! Please note that this book is only sold in sets of ten. This new book fully covers each of the 24 Content Standards in the American government curriculum based on the 2015 released guidelines. Students get to learn, apply, and reinforce all of the major terms and concepts of American government. The information in the book is delivered in a concise but thorough summaries that provide the most important information about each Content Statement. The book is highly illustrated, containing hundreds of photographs, diagrams, and charts. The text is presented in a student-friendly manner and based on the latest educational research on how students learn and remember. With more than 450 questions that mirror the format of Ohio’s new assessment, students will receive ample practice on new the test format. This book is organized in the same manner as the Ohio curriculum –– by units. Each content standard is a separate chapter that explores each of the 33 Content Standards in the American history curriculum based on the newly released guidelines. There are almost four hundred practice questions –– all in the same format as the new assessment. Each of these questions provides a wide-range of practice in answering every type of questions students will find on the assessment. Students receive extensive practice –– with questions after each content statement, at the end of each unit, in a comprehensive midterm, and a complete final practice assessment. All of these questions mirrors the distribution and level of difficulty on the American history assessment. Each content standard is covered in a concise but highly readable summary that provides the most essential information students need. The book is highly illustrated, containing hundreds of photographs, maps, diagrams, and charts. This book is written in a student-friendly manner with clear and insightful explanations, accompanied by a plethora of historical maps and illustrations. The book weaves together all of the TEKS in world history in a narrative framework that your students can easily follow. This book also includes key learning features to maximize student potential, making this the single best resource to prepare your students for the new End-of-Course STAAR test! This book is only sold in sets of 10. The task now facing social studies teachers and their students is daunting. There are just so many TEKS, old and new! Can it be done? This book completely covers all of the TEKS in United States History since 1877. Information is organized logically through a chronological approach to United States history. The book incorporates a variety of learning features based on Marzano's Classroom Instruction that Works. MASTERING THE TEKS IN WORLD GEOGRAPHY. This book provides complete coverage of all the TEKS in World Geography. The book can be used as the basis for a complete course organized around key themes--from physical geography and demography to political geography and globalization--or it can be used in conjunction with a regional approach. Either way, this comprehensive resource is simply the best way for teachers and students to be sure they have covered every one of the TEKS in World Geography before taking the new, high-stakes End-of-Course STAAR test. This book has it all: mini-regional surveys, explanations of key geographical terms and concepts, exciting student activities, and hundreds of practice assessment items! In addition, bilingual glossaries and final practice tests are available. A set of 30 practice tests costs $120. A set of 30 bilingual glossaries is available for the same low price of $120. If you are searching for a book to prepare your students for the new Grade 8 STAAR Test in Social Studies -- with its greater "rigor of assessment," its focus on interpreting documents, the names of many new historical figures, and tough new "readiness" standards -- then your search has ended! This book has a clear and straight-forward narrative, Applying What You Have Learned, Amateur Historian, and Learning with Graphic Organizer activities, concept maps, study cards, scores of extracts from documents listed in the TEKS, hundreds of practice assessment items, and a final practice test based on the TEA blueprint. Why wouldn't each of your 8th grade students want an individual copy of this inexpensive book to study from in school and at home to ensure a stellar performance on the new high-stakes STAAR test? Use your IMA funding to help your STAARS really shine! 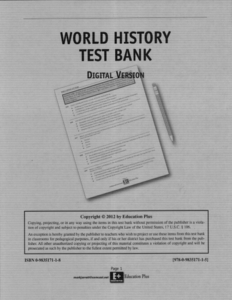 Visit the website of Education Plus for information about our test banks in Grade 8 Social Studies, US History since 1877, World History, World Geography and Grade 7 Texas History (Mini-Test Bank). Each test bank is licensed on a district-wide basis only and pricing is based on the size of the district. Education Plus is the sole source provider for these products and can furnish your purchasing department with the necessary vendor forms. For more information, please visit www.educationplus.us, email Dr. Jarrett at markjarrett@comcast.net, or call (925) 906-9742. How can your students be expected to remember all of the people, places, and events of four thousands years of history, covering all world cultures? This glossary can help them do it. The names of key individuals, places, terms and concepts with detailed definitions and identifications are organized by chapter, in the same order in which they appear in Mastering the World History TEKS. This will become an essential study tool for the new End-of-Course test in World History. The price for a set of 30 is $140.00. ISBN: 1-935022-19-9. Available in English Only and Bilingual Spanish/English Editions. Also Available: A Glossary of Terms in World Geography.